On November 6th, I will be part of a panel on superheroes, morality and the modern world at Dominican University. As a lead up to that event, I thought I rerun a series of articles that first appeared on Clearance Bin Review and that would delve into a topic that is at the heart of this panel’s discussion. And that topic is: just what is a superhero, anyway? 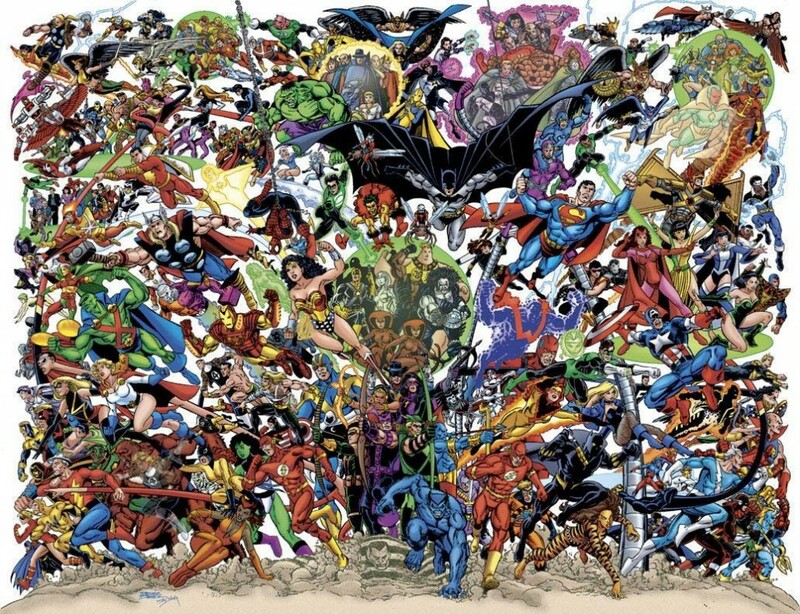 When you think about superheroes, ten-to-one you’re thinking of a Marvel character or a DC character from each respective line of comic books. Extra points if you can name all the characters shown. If you are really into comic books, then you may be thinking of a Vertigo, Image, or Dark Horse character. Regardless of the universe or publishing company, people have traditionally thought of superheroes as being the most well-known genre of the comic book medium. Originating there, these characters have subsequently been developed in and licensed out to all types of media – even cookbooks! Most scholars agree that superheroes began with Superman. But what about older pulp heroes, like The Shadow, Mandrake the Magician, The Phantom? Or the mythical, legendary, and religious figures that were the template for the pulp heroes? Or characters from other parts of the world? Do any of these qualify as being superheroes? What do you think? Superhero, or just hero? According to Peter Coogan, author of Superhero: The Secret Origin of a Genre, three main elements define a superhero: mission, powers, and identity. The mission characteristic reflects the individual’s actions: the actions must be prosocial, selfless, and in alignment with the values of the society for which s/he fights. Powers, of course, refers to those abilities the individual can do that are above and beyond what a normal human can do; they often appear magical or defying the very laws of reality. Identity is comprised of the individual’s codename and costume, with the idea of the secret identity being a counterpart to the codename, and both the codename and the costume in some way reflects the superhero’s mission and powers. I expand upon his discussion of costume by making it more flexible. To me, the costume can be any manifestation of a physical form that is not recognizably human but is a visually iconic representation of the superhero’s identity. Thus, Coogan applies his criteria to argue for why Superman, and not his pulp fiction predecessors, should be considered as the first true superhero when introduced in Action Comics #1 in 1938. Superman has a clearly identified mission: for truth, justice, and the (originally) American way. He clearly has super-human powers, which have grown over the years, moving from super-speed and super-jumping to super-light flight and essentially complete invulnerability. And he has a secret identity (Clark Kent), a codename (Superman), and a costume (the underwear is a must). Indeed, we can see how Superman served as the template for copycats and parodies over the years – I’m looking at you, Underdog. While pulp fiction heroes may have had these elements – for example, The Shadow, The Phantom, and Zorro — Coogan argues the amplification of these three elements, along with the introduction of Superman, is what led to the concept of superhero that we have today. So how do the Marvel’s and DC’s so-called superheroes stack up when dissected along these three elements? Would they still be considered superheroes? I compared a number of comic book characters, and threw in two pulp heroes, to see how well they met the criteria. This graphic shows my thoughts. How would others you know fit this matrix? 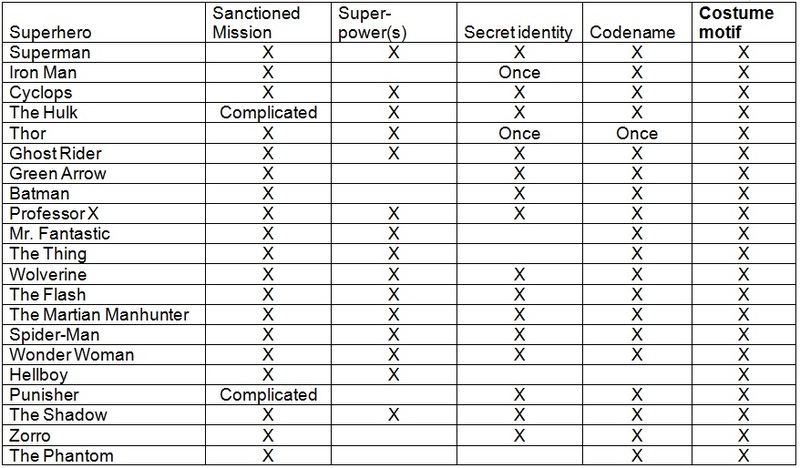 Not all American superheroes may fit all categories, but the single connecting element appears to be the iconic costume worn when engaging in mission related activities. The importance of this visually iconic representation is primarily due to the nature in which it evolved. Given that the majority of these characters arose in the primarily visual medium of comic books, the easiest way to represent the character’s identity was how s/he looked. Thus, when s/he was fighting the good fight, it was important for the character to be represented in a way that distinguished his or her actions from those around him or her. We do not see action in real-time in a comic – we only see the suggestion of action. Linking the character’s appearance to the action s/he normally takes due to his or her powers and mission is one way to suggest what the action is. So these have been the ideas of two academics. 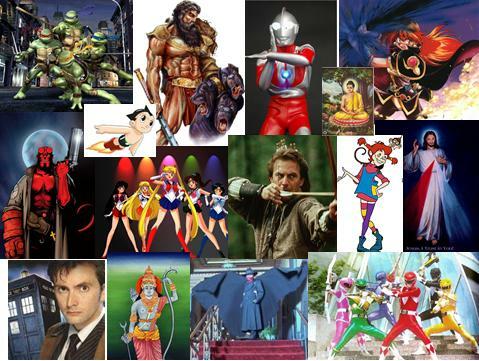 To see if our ideas of what defines a superhero are a global phenomenon, I created a survey in 2009. The survey was advertised across different country specific Facebooks, from the United States to Japan, from South Africa to Sweden. Over a thousand people partially completed the online survey hosted by SurveyXact. For one part of the survey, they were asked to indicate how often they thought a particular defining characteristic was important to determining who is a superhero. Across the various culture, the most important agreed upon characteristics were powers, mission, and, interestingly, having an origin story. Notice there is nothing about the appearance of the character. Instead, the actions of the character took precedence, as well as the inclusion of some type of origin story to explain how that character came to be. After these top ranked characteristics, people decided that the costume motif, codename, and secret identity were important, along with having a supervillain as an arch-nemesis. Towards the bottom of the list is the requirement for the character to be in some form of fantastical story. The lack of endorsement for this item may be due to the prevalence of the realism trend in superhero films that have been disseminated around the world since 2000. Unfortunately, I had not thought of asking specifically from where the sample knew their superheroes. However, the sample did indicate that they were more likely to watch American movies, television and cartoons than read American comic books. It appears the worldwide knowledge of superheroes has been more influenced by their moving portrayals rather than the comic book canon from which they arose. Thus, it may be that they would be less likely to conform with Coogan’s definition, given that it focuses largely from the comic book medium. For the world at large, superheroes have become divorced from comic books. The prevalence of the moving portrayals could also explain why the visual appearance of the superheroes was less important than his or her actions. Of course there remain visually iconic superheroes whose appearance is little changed from comic book to film (i.e. Superman, Ghost Rider, Spider-Man); but, there are also those figures whose appearance has changed (i.e. X-Men, Batman, Punisher). Also, movies, television and cartoons show moving pictures that allow for the portrayal of actions in a way that comic books cannot. A consumption of comic books may heighten the importance of the visual depiction, whereas a consumption of moving portrayals may heighten the importance of the actions. Divorcing the superhero from the comic book could mean that the definition people use to make sense of superheroes will open up the field to what could be a superhero. To drive home this point, I asked them to indicate if wearing tights and capes is a must. This visual appearance has for so long been the points of reference made in both serious and comic discussions of what constitutes a superhero, leading to deconstructions, parodies and satires of superheroes, from Nite Owl to The Tick to The Incredibles. What is most striking is the tremendous lack of agreement that a superhero must wear tights and capes. The fact that this characteristic is at the bottom of the list again serves to showcase the primacy of the recent movies and the realism slant taken in them. Across all the characters I asked about, the American characters classically defined as superheroes were seen as such, and the most well-known. The participants’ answers to defining superheroes could be based on their familiarity with these DC and Marvel characters, coming to them via movies, television shows and cartoons. Then, using these definitions, the participants may judge other characters, from the United States and other countries, as to whether or not they match the characteristics seen in the DC and Marvel characters. In fact, when given the room to say who they think would be the first superhero, or a superhero from another country, these non-traditional superheroes were also seen by some as superheroes. This result indicates the looseness of the definition as applied to characters from various times, genres and cultures. In my next column, I’ll explore a number of characters from other countries than America that could be identified as superheroes. Following that, I will do the same type of exploration for religious, legendary, and mythical figures. Overall, the point of this series is to examine how we make sense of what a superhero is; to that end, I encourage discussion, challenges, questions, debate. These are my arguments for just what a superhero is: what are yours? Thank you for another wonderful post. The place else may anybody get that kind of info in such a perfect manner of writing?